Stunning images, amazingly flexible and rock solid. The D2X is a real workhorse. Without question the best camera, film or digital, I have ever used. I got my D2X in June 2005 and have shot around 8000 or more images since then. It was a harder camera to wrap my head around and was wondering if I made a mistake buying it. I didn't. Now that I have mastered this beautiful machine, I am very very very happy with it. I can do tack sharp long exposure night shots to fast action shots with amazing clarity. I just returned from Amsterdam, Germany and Greece and shot around 2500 images. I added some good lenses plus a Nikon Sling AW backpack to complete the rig. One thing that any photographer should never mistake though. When you start out, don't start with something like this. Even a decent 3 MP camera with a good lens can give very fulfilling images. A major reason for me buying this camera is that if affords me great cropping options. I can take a 12MP image and creatively crop it in many ways without losing quality. I bought my D2x about 8 months ago and have shot several thousand pictures, with great results, but I miss my Nikon F5 for the higher quality slides, so I use both cameras now. The F5 is loaded with the new Fujichrome Velvia 100 Pro Slide film, which is about 20 megapixels after scanned at 4000 dpi. 1) Build quality and ergonomics are outstanding. The viewfinder image is bright and I can manually focus my lenses in most situations if I want to. I don't have huge hands, so some of the controls require a little stretch, but nothing that is too difficult to manage. 2) The 3D Matrix II meter is AWESOME. I get great exposures, even better than my F5. In addition, the Auto whitebalance is excellent. It is possible to fool it, but it gets the situation right 95% of the time, especially outdoors. 3) Autofocus is incredible. The 11-point AF system gives me MUCH better frame coverage than I had with the F5. It's also more sensitive and faster to aquire focus, even in low-light situations. Although there are reports out there about focusing issues with the D2X, my camera does not have any problems. What I HAVE discovered, however, is that it's REALLY EASY for the camera to lock-on to an object that is slightly offset from where the focus indicator is. This is partly due to operator error-- you have to be really careful with your technique, and the fact that the actual AF sensors are MUCH larger than the little reticles in the viewfinder. At least I can check my image on the LCD to see if I need to redo it. I Have had my D2x for about 2 months now and all I can say is Wow. I am coming from a D1X and a D70. I lave the way it feels in your hands and the a/f id great.Ilove the skin tones and color I get with this camera. Now all I need is a more powerfull computer to handle the large files. The D2X is a very capable camera. Whether the cost of ANY camera is appropriate, depends on the needs of its user. The D2X is more than "worth it" if you're shooting in a studio, find yourself doing tons of cropping, and or consistantly need a large file size for printing, etc., etc.. The D2x in my opinion is an excellent camera. I favor the D2hs for web use and for selling photos (many of which will be mixed with video footage) on CD/ DVD. There is no doubt that this camera makes hughe pictures. But, the times you could run around and shoot just anything is over here. The camera works great in perfect light conditions and is amazingly fast. On the other side one feels right away that she has not been made for people who want to shoot under just any conditions and lightburns in bright lights as well as high noise in weaker light conditions occur very fast. This is a pure pro camera for quiet and targetted use. Pictures beyond 400 ISO are noisy and allmost unuseable. I compared the noise to the D70 and at 800 ISO the D2X exceeds the noise of the D70 at 1600 ISO. 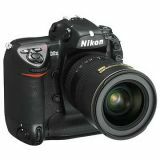 For people who intend to use this as an allround camera it is not a bargain and for those who appreciated the comfort in flash possibilities and the handling of a D70 it's not a step forward eather. Not to forget the horrible time you spend to open and save this large files as well as the space you need compared to the nef files of a D70 (on which I would like to have non compressed nef's as well,). It's a pro camera but fun for anyone. I can not stress the amazing quality I get with this thing. I can take a shot of someone from their waist up to their head and see the pores on their face (true, I've done it and was shocked). It's my fourth D-SLR and although I love the others, there's little comparison. In the last 6 weeks I've shot about 9,000 images and have done high-key studio, low-key studio, mixed lighting outdoor portraits, late night long shutters, fine art daytime with no flash, etc. etc. and in each case it's both surprised me and it's out-performed the others. I got mine in May 2005 and have shot over 600 images with it already.. Cannot wait to use it every weekend..
D2X is a absolutely great camera and I am very happy with mine! This is a must own professional grade DSLR camera. IExif 1.8 can show you the Total Number of Shutter Releases for your D2X. Why would you shoot this image at ISO 200 when the D2x has the capability of shooting at ISO 100? That would make more sense. This leads me to believe you have edited the EXIF data and are trying to get some more hits on your gallery. You should've edited the EXIF to say ISO 100 to make it a bit more beleiveable as well as post a full resolution shot. Gotta get them in somehow I guess. Not to mention you have edited your D2H camera shot in your camera gallery to show D2X logo. Try a bit harder next time. You're not fooling anyone. This is probabely going to be one of the future hits on the market, but, showing here a picture 5 month prior to it's release without any exif file is somewhat strange, or is there someone who want's to compete in an unfair way for glory ... ?